The coal is stored in coal storage plant, from the coal storage plant coal is delivered to the coal handling plant. Where it set crushed into the small pieces, then coal burnt in the boiler and ash produced is removed with the help of ashen handing plant. 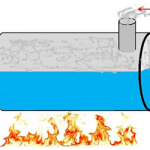 Heat combustion of the coil in the boiler is utilized to convert water into steam at high temperature and pressure. 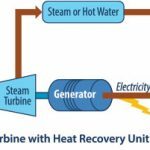 The steam produced in the boiler is wet and is passed through a superheater where it is dried and superheated by the flue gases, because of this overall efficiency is increased and too much condensation in the last stage of the turbine is avoided. The economizer extract the part of the heat flue gases increased the feed water temperature. Air preheated extract heat from flue gases and increased the temperature of air used for coal combustion in this way there is increased in thermal efficiency and stream capacity per square meter of the boiler surface. 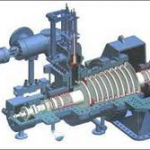 Dry and superheated steam from the superheated is feed to the steam turbine through the main valve which converts heat energy into mechanical energy. The mechanical energy from steam turbine is converted into electrical energy with help of more alternate. 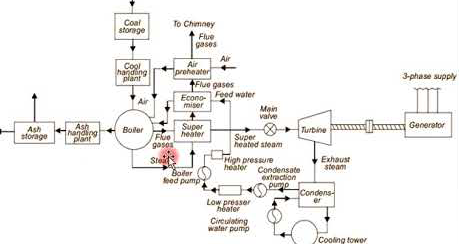 The condensate from the condenser is used as feed water to the boiler, the feed water on its way to the boiler is heated by water heater and economizer. In case the availability of the water from the sources of supply is not assured throughout the year. The cooling tower is used.